October 23 - Russia enjoyed the most successful start on the opening day of the Judo World Junior Championships at the Stozice Centre in Ljubljana. Anastasia Pavlenko took the first of two golds, defeating Junior European Championships bronze medallist Andreea Stefanescu of Romaina in the under 44 kilogram final. The 10-time Junior European Cup medallist secured her first major title with an ippon in the closing seconds of the contest. Stefanescu looked to have won the contest when she scored a yuko with just 11 seconds left on the clock; however Pavlenko responded immediately with an ippon to win the contest. Japan's reigning cadet world champion Honoka Yamauchi took the first bronze medal of the category, beating France's Cheyenne Mournier, while Tunisia's African champion Olfa Saoudi of Tunisadefeated Bulgaira's European junior gold medallist Borislava Damyanova to claim the other one. Russia's second gold came via European junior champion Irina Dolgova in exquisite style as she propelled herself to the top of the sport in her age group in the under 48kg category with a superb win over Romanian Alexandra Pop after just 32 seconds. The Junior European Cup bronze medallist was caught with a yoko-tomoe-nage and Dolgova continued the movement by transitioning into a juji-gatame which forced the Romanian to submit. The first -48kg bronze was won by Japan's Yamazaki Tumami, who beat Brazilian Gabriela Chibana, with the second claimed by France's Amandine Buchard, who beat Switzerland's Tamara Silva. European junior silver medallist Vincent Manquest led France to their first gold of the tournament with a victory over Junior Pan American Championships bronze medallist Armando Maita in the under 55kg weight category. The Venezuelan did well to slip out of an uchi-mata attempt by Manquest, however it was the Frenchman who had the final say, scoring a yuko off of a ouchi-gari with just a second left of the contest. The first men's bronze was award to Brazilian Vitor Torrente, who came from behind to beat Bulgaria's Valentin Alipiev, with Georgia's two-time Junior European Championship runner-up Leri Tchelidze defeating Japan's Nagayama Ryuju for the other. The final gold medal of the day fell into the hands of South Korean judoka An Baul in the under 60kg men's category. 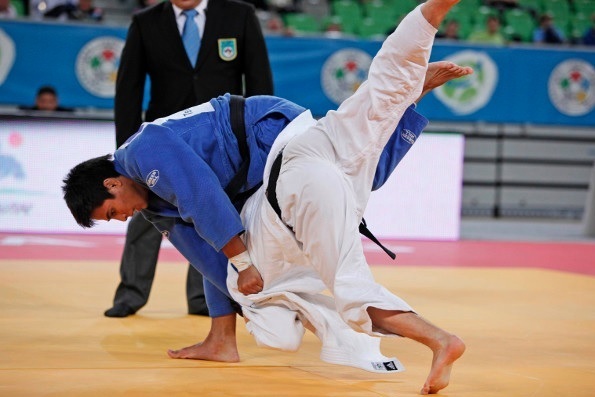 Baul, and his opponent, Uzbekistan's Diyorbek Urozboev, secured their place in the final in emphatic style with each athlete winning their semi-final with an ippon. The South Korean was hoping to erase any memories of the 2011 Junior World Championship final which saw him lose to Japan's Takato Naohisa, now senior World Champion and managed it, winning by wazi-ari after four minutes of quality action. Former Junior Asian Champion Oshima Yuma of Japan won the first bronze of the category, beating Orej Valizada of Venezuela by ippon, while Turkey's Ahmet Sahin Kaba beating Kazakhstan's World Military Championships silver medallist Meirlan Baimakhanbetov in just 95 seconds to claim the second bronze medal. To watch the latest action on Judo TV click here.